A private detective visiting Los Angeles on a routine investigation, Harry D'Amour gets more than he bargains for when he encounters Philip Swan, a performer whose amazing illusions captivate the world. But are they really illusions? Harry isn’t so sure as he is thrust into a nightmare of murder, deception and terrifying assaults from the dark beyond. For the third – and apparently final – big-screen directorial effort from horror auteur Clive Barker, we head to 1995’s Lord of Illusions. In the Mojave Desert circa 1982, Nix (Daniel von Bargen) leads his own cult but faces a challenge from a rival named Philip Swann (Kevin J. O’Connor). Nix kidnapped a child for an apparent ritual and Swann wants to stop him. Swann tracks down Nix but before he can take care of the madman, the cult leader works his magic. Nix seems to share his power with Swann but before this transference ends, various parties shoot Nix and appear to kill him. Swann and company then bury Nix “so deep that no one will ever find him”. After that we move to then-present day 1995. New York private detective Harry D’Amour (Scott Bakula) goes to Los Angeles for what appears to be a routine assignment. Although Harry often deals with supernatural areas, this time he gets a basic insurance fraud scam to investigate. Once he arrives in LA, though, Harry eventually finds something closer to his usual turf. As Harry tracks his target, he comes across Nix’s former second-in-charge Butterfield (Barry Del Sherman) in the midst of torturing Quaid (Joseph Latimore), one of Swann’s old accomplices. This gets Harry into something more dramatic than he initially anticipated. He encounters Swann, now a successful, wealthy stage illusionist married to lovely Dorothea (Famke Janssen), a woman with a surprising past. The Swanns seek out Harry for his assistance in various affairs that may connect to the planned-for resurrection of Nix. Fresh off a recent screening of Barker’s second film – 1990’s Nightbreed - I went into Illusions with guarded optimism. I thought Nightbreed wasn’t anything great, but it had potential, so I hoped Illusions might deliver a more compelling experience. To some degree, I felt this way because I figured it’d probably fix one of Nightbreed’s major flaws: its main actor. I thought Craig Sheffer seemed weak in the earlier film, so I hoped the more talented Bakula would give us a better-acted lead. And that part of the equation definitely holds true. While I don’t think Bakula is an “A”-level actor, he’s undoubtedly talented, and he handles the lead role well. He manages a nice world-weary tone proper for the part, and he also manages to deal with the supernatural side of things appropriately. After the void Sheffer left in Nightbreed, I’m happy to see Bakula bring substance to the heart of Illusions. The movie itself also holds together better than the scattershot Nightbreed. In that case, I thought the narrative seemed loose and erratic, whereas Illusions follows a more concise – and involving – tale. The 1982 opening brings us into the plot in a dramatic manner, and it then traces a logical, intriguing path from there. Barker shows better control over the story of Illusions than he did in Nightbreed. That movie got bogged down in all its creatures and related concepts, which meant it rambled and went astray. In Illusions, Barker keeps everything moving in the right direction. It introduces characters well and then allows them – and the plot – to develop in a rich manner. It also manages a nice balance between the real and the supernatural. I feared Illusions would tip its hand too much, but it doesn’t, as it keeps things better focused in the “real world” than I anticipated. Of course, being a Barker flick, we get into “true magic” along the way, but the situations seem better integrated than often occurs in this kind of film. At more than two hours for this “Director’s Cut”, Illusions might run a little long, but that remains a minor complaint. Barker fills the movie with interesting characters, a tight plot and solid action to provide a lively mix of film noir and the supernatural. Lord of Illusions appears in an aspect ratio of approximately 1.78:1 on this Blu-ray Disc. Though it had strengths, the image came with more problems than I’d like. Sharpness was usually fine, but exceptions occurred. Wide shots occasionally became tentative, so some of those could be a bit on the fuzzy side. Still, overall clarity was positive; I couldn’t call this a razor-sharp image, but it looked reasonably precise. No issues with jaggies or moiré effects appeared, and I saw no edge haloes. Print flaws were a more obvious concern, though, as a mix of specks and marks popped up through the film; while not heavy, these created too many distractions. Colors looked decent to good. While not the most dynamic palette, the hues usually looked reasonably peppy and full, with only a little muddiness at times. Blacks were fairly deep, and shadows showed acceptable clarity; some low-light shots lacked great definition, but they were mostly fine. I thought this was a “C+“ presentation, with most of my complaints related to the print defects. I felt more pleased with the satisfying DTS-HD MA 5.1 soundtrack of Nightbreed. The movie exhibited pretty positive spread across the front. Various elements like vehicles moved smoothly across the front, and the track managed to provide a fair sense of place. Music also demonstrated appropriate stereo spread. In terms of surround usage, the back speakers didn’t have a lot to do throughout the film. Nonetheless, they added general dimensionality and contributed pizzazz during the movie’s louder sequences. Split-surround usage seemed positive at appropriate times. Audio quality was fine. Speech remained natural and concise, with no roughness along the way. Music showed nice fidelity and range, and effects appeared fairly accurate and robust. The track didn’t boast a ton of oomph, but it showed decent low-end. Nothing here dazzled, but the result was good enough for a “B”. As we move to the set’s extras, we find both the film’s theatrical version (1:48:53) as well as a Director’s Cut (2:01:33). The former appears on one disc – along with the film’s trailer - while the latter shows up on a separate platter. Because this Blu-ray represents my initial screening of the film, I can’t comment on the changes between the two cuts, but I wanted to mention their inclusion. 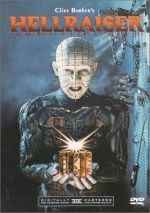 Alongside the Director’s Cut, we get an audio commentary from writer/director Clive Barker. He provides a running, screen-specific look at story/characters, cast and performances, music, sets and locations, various effects, cinematography, changes for the Director’s Cut and other topics. Recorded back in the 1990s for a laserdisc, Barker offers a spotty chat. At times he manages to give us good insights into the movie, but he often does little more than narrate the film. That means we find an erratic commentary with too many ups and downs. Also with the “Director’s Cut”, we find A Note from Clive Barker. In this one-minute, 56-second text intro, Barker discusses the film’s story/characters as well as aspects of the Director’s Cut. Written in 1995, we find out the DC was put together way back then – unlike the newly-assembled longer version of Nightbreed. Barker’s intro gives us some decent details. A collection of Original Behind the Scenes Footage fills one hour, one minute and 57 seconds. Prepared in 1995, we hear from Barker, magic consultant/actor Lorin Stewart, makeup effects artists Howard Berger and Wayne Toth, and actors Scott Bakula, Daniel von Bargen, Kevin J. O’Connor and Famke Janssen, The piece looks at the movie’s roots and development, story and characters, thoughts about magicians/illusionists, cast and performances, makeup effects, and influences. At more than an hour in length, I hoped “Behind the Scenes” would be illuminating. However, it doesn’t often go much of anywhere. Much of it consists of footage from the shoot, which is usually a good thing – I like the fly on the wall perspective - but the result seems somewhat dull here. The occasional interview segments add a little knowledge but also don’t feel especially valuable. The show has its moments but not enough to keep us involved over its full length. Called A Gathering of Magic, a 17-minute, 52-second featurette includes notes from Barker, Bakula, Janssen, von Bargen and producer JoAnne Sellar. “Magic” covers story/character areas, visual/set design, cast and performances, and various effects. Essentially “Magic” feels like an extension of the longer “Behind the Scenes” package. Like its predecessor, it comes with some good notes but lacks comsistency. Four Deleted Scenes occupy a total of three minutes, 21 seconds. These offer minor moments, with two that show more of Nix’s cult, one that depicts Dorothea in limbo and another that provides Harry at the magic venue. All four seem pretty forgettable. The scenes come with non-optional commentary, as Barker talks about the segments and why they didn’t make either the theatrical or director’s cuts. He offers useful notes but it’s annoying we can’t view the sequences without his thoughts. Next we find an Interview with Storyboard Artist Martin Mercer. This goes for 11 minutes, 55 seconds and provides Mercer’s thoughts about his career, working with Barker and his art for Illusions. We also see comparisons between the storyboards and the final film. Mercer provides a good chat that covers the material well. Finally, we locate a Photo Gallery. We see a running 15-minute, 53-second compilation that shows poster art, publicity shots, images from the production and behind the scenes snaps. It offers a good collection but I’m not wild about the interface. 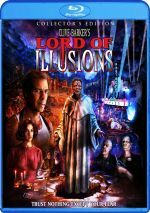 With 1995’s Lord of Illusions, we discover a good mix of horror, supernatural elements and film noir. The movie falters occasionally but usually delivers a taut, involving piece of work. The Blu-ray brings us erratic picture, positive audio and a decent set of bonus materials. Illusions winds up as a satisfying meld of genres and a fun flick.